1 Hear, O God, my voice in my complaint, From the fear of the enemy guard my life. 4 To shoot in hiding-places [at] the upright: Suddenly they shoot [at] him, and fear not. 5 They strengthen themselves [in] an evil plan, They talk of laying snares, They say, Who looks at them? 6 They scheme villainies, We have perfected [say they] a scheme [well] schemed: And the inward part of each, and [his] heart, is deep. 7 But God shoots [at] them [with] an arrow, Suddenly come their wounds. 8 And they are made to stumble, Their own tongue [comes] upon them, All who look on them shake the head. 9 And all men fear, And declare the act of God, And understand His work. 10 The righteous shall rejoice in Jehovah, and take refuge in Him, And all the upright in heart shall glory. Familiar notes are struck in this psalm, which has no very distinctive features. Complaint of secret slanderers, the comparison of their words to arrows and swords, their concealed snares, their blasphemous defiance of detection, the sudden flashing out of God's retribution, the lesson thereby read to and learned by men, the vindication of God's justice, and praise from all true hearts, are frequent themes. They are woven here into a whole which much resembles many other psalms. But the singer's heart is none the less in his words because many others before him have had to make like complaints and to stay themselves on like confidence. "We have all of us one human heart," and well-worn words come fresh to each lip when the grip of sorrow is felt. The division into pairs of verses is clear here. The burdened psalmist begins with a cry for help, passes on to dilate on the plots of his foes, turns swiftly from these to confidence in God, which brings future deliverance into present peril and sings of it as already accomplished, and ends with the assurance that his enemies' punishment will witness for God and gladden the upright. In the first pair of verses complaint is sublimed into prayer, and so becomes strengthening instead of weakening. He who can cry "Hear, O God, guard, hide" has already been able to hide in a safe refuge. "The terror caused by the enemy" is already dissipated when the trembling heart grasps at God; and escape from facts which warrant terror will come in good time. This man knows himself to be in danger of his life. There are secret gatherings of his enemies, and he can almost hear their loud voices as they plan his ruin. What can he do, in such circumstances, but fling himself on God? No thought of resistance has he. He can but pray, but he can pray; and no man is helpless who can look up. However high and closely engirdling may be the walls that men or sorrows build around us, there is always an opening in the dungeon roof, through which heaven is visible and prayers can mount. The next two pairs of verse (3-6) describe the machinations of the enemies in language for the most part familiar, but presenting some difficulties. The metaphors of a slanderous tongue as a sword and mischief-meaning words as arrows have occurred in several other psalms (e.g. , lv. 21; lvii. 4; lix. 7). The reference may either be to calumnies or to murderous threats and plans. The latter is the more probable. Secret plots are laid, which are suddenly unmasked. From out of some covert of seeming friendship an unlooked-for arrow whizzes. The archers "shoot, and fear not." They are sure of remaining concealed, and fear neither man's detection of them nor God's. The same ideas are enlarged on in the third verse-pair (5, 6) under a new metaphor. Instead of arrows flying in secret, we have now snares laid to catch unsuspecting prey. "They strengthen themselves [in] an evil plan" (lit. word) pictures mutual encouragement and fixed determination. 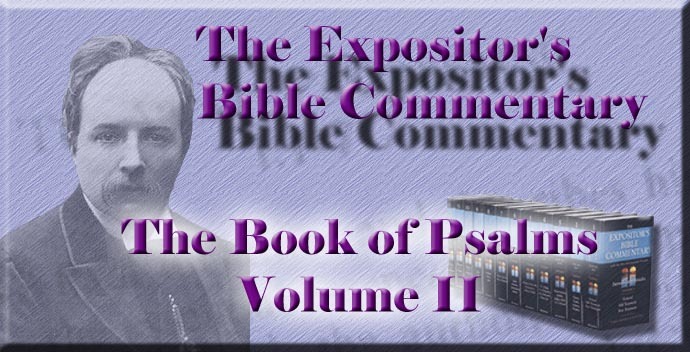 They discuss the best way of entrapping the psalmist, and, as in the preceding verse, flatter themselves that their subtle schemes are too well buried to be observed, whether by their victim or by God. Ver. 6 tells without a figure the fact meant in both figures. "They scheme villainies," and plume themselves upon the cleverness of their unsuspected plots. The second clause of the verse is obscure. But the suppositions that in it the plotters speak as in the last clause of the preceding verse, and that "they say" or the like expression is omitted for the sake of dramatic effect, remove much of the difficulty. "We have schemed a well-schemed plan" is their complacent estimate. God's retribution scatters their dreams of impunity, as the next pair of verses (7, 8) tells. The verbs are in the past tense, though the events described are still in the future; for the psalmist's faith reckons them to be as good as done. They were shooting at him. God will shoot at them. The archer becomes a target. "With what measure ye mete, it shall be measured to you again." Punishment is moulded after the guise of sin. The allusion to ver. 4 is made more obvious by adopting a different division of ver. 7 from that directed by the accents, and beginning the second half with "Suddenly," as in ver. 4. Ver. 8 b is with difficulty made intelligible with the existing reading. Probably the best that can be done with it is to render it as above, though it must be acknowledged that "their tongue comes upon them" needs a good deal of explanation to be made to mean that the consequences of their sins of speech fall on them. The drift of the clause must be that retribution falls on the offending tongue; but there is probably some textual corruption now unremovable. Cheyne wisely falls back on asterisks. Whatever is the precise nature of the instance of lex talionis in the clause, it is hailed with gestures of scornful approval by all beholders. Many men approve the Divine punishments, who have no deep horror of the sins that are punished. There is something of a noble, if rough, sense of justice in most men, and something of an ignoble satisfaction in seeing the downfall of the powerful, and both sentiments set heads nodding approval of God's judgments. The psalm closes with the familiar thought that these judgments will move to wholesome awe and be told from lip to lip, while they become to the righteous occasion of joy, incitements to find refuge in God, and material for triumph. These are large consequences to flow from one man's deliverance. The anticipation would be easily explained if we took the speaker to be the personified nation. But it would be equally intelligible if he were in any way a conspicuous or representative person. The humblest may feel that his experience of Divine deliverance witnesses, to as many as know it, of a delivering God. That is a high type of godliness which, like this psalmist, counts the future as so certain that it can be spoken of as present even in peril. It augurs a still higher to welcome deliverance, not only for the ease it brings to the suppliant, but for the glory it brings to God.